The world's largest and most populous continent, Asia is a region of rich diversity and splendor. We split Asia into four different regions - Southeast Asia, Northeast Asia, South Asia, and Central Asia. In eastern Asia, the regional powers China, Japan and Korea are as different as they are powerful. In Central Asia, the former Soviet Republics continue to evolve and to develop their own identities. Southern Asia is home of a rising power, India, while right next door Pakistan is an intriguing nation. Things are buzzing in Southeast Asia where countries like Thailand and Vietnam continue to develop rapidly while holding on to traditional ways. Asia is a great region to add to a longer, multi-stop trip. Below is a route idea that includes some of Asia's best highlights. To customize this trip and make it your own, register for a BootsnAll membership (it's free!). Once a member, you'll be able to build, search, price, and book your multi-stop flight - all online. Trying to narrow down where to go in massive continent like Asia can be challenging, so we've chosen a handful of highlights, or pillars, for each region. The food in Southeast Asia is some of the best in the world. Check out street food in Bangkok, pho in Vietnam, the varied cuisine of Malaysia, and the underrated food scene in Laos. Beaches - If you're a beach bum, you've come to the right place. 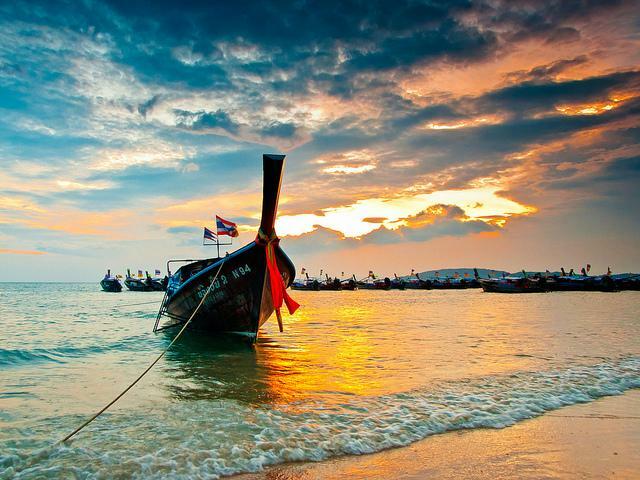 Nearly every country in Southeast Asia has some world class beaches to visit. Check out the many famous sites in the region - like Angkor Wat in Cambodia, Halong Bay in Vietnam, temples in Thailand, rice terraces in Indonesia, and the temples of Bagan in Myanmar - these just scratch the surface. China is an intimidating place to visit for any traveler, but there's a lot of misconceptions about what travel is like there. Though many think they have to take a tour to travel here, it is in fact possible to travel independently in China. Though one of the more expensive places in the world to visit, Japan is worth the extra expense, and we have many tips to find the real Japan. South Korea was on BootsnAll's Top Indie Travel Destinations for 2013, and with good reason, as this often overlooked destination packs a powerful punch with lots of great experiences to be had. There are a myriad of reasons to go to India, as it could be said that India is the pinnacle of indie travel destinations - one that challenges you at every turn, but rewards you with an experience like no other. Bhutan may not be the most popular of places to visit, but it won't be long before other travelers catch on and realize why it's worth it to visit the country that has a GNH (Gross National Happiness). Another top destination for 2013, Sri Lanka is becoming a more popular country to visit each year, for the still off-the-beaten-track areas and the food. There may not be a less visited region of the world than Central Asia, where the former countries of the Soviet Union combine to make a truly indie travel experience. Travelers have a myriad of options when it comes to flying into Asia, and if you are looking to add Asia to your itinerary as part of a longer trip, check out Indie, BootsnAll's multi-stop flight tool, to search, price, and book your trip. There are obviously thousands of hotels in Asia, and the come in literally all price ranges. Luxury is never far away, but cheap places to sleep are available almost everywhere outside of Tokyo and a few other major cities. There are also endless hostels in Asia as well. One interesting thing about the hostel scene in this part of the world is the places with no hostels tend to be places where hotels themselves are so cheap that demand for dorm beds just isn't there. In those cities you'll still usually see budget hotels listed where the hostels would be, so it's worth checking those if you are on a budget.